The Russia Investigations: The House Intel Committee Duels Over Evidence. Again Democrats complain there is a lack of evidence present in Republicans' report because Republicans didn't look for it. But it might also not be there because it doesn't exist. 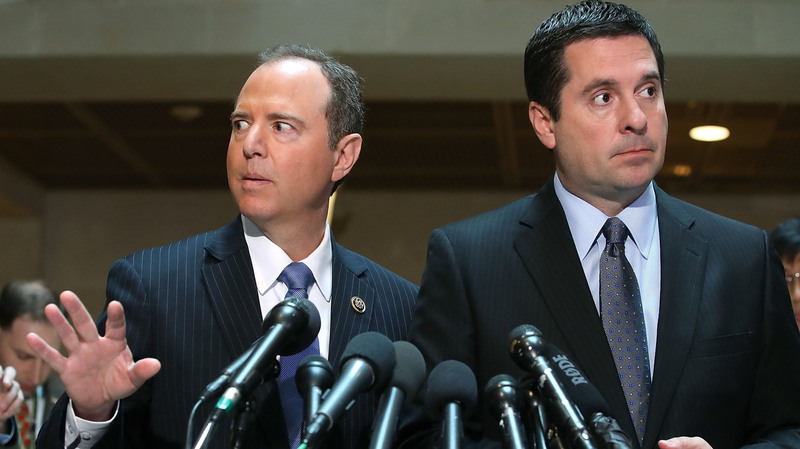 House intelligence committee Chairman Devin Nunes, R-Calif. (right), and ranking member Rep. Adam Schiff, D-Calif., speak to the media last year about committee's investigation into Russian interference in the 2016 presidential election. Republicans on the House intelligence committee gave President Trump another clean bill of health this week. And the committee's Democrats laid out how much they say he has to fear. In the latest document duel within the panel, ranking member Rep. Adam Schiff, D-Calif., and his colleagues submitted a game of legal Mad Libs that left blank areas that they say they were unable to fill in to solve the riddle. Republicans, who controlled the intelligence committee's Russia investigation, did not go along with the type of investigation that would have enabled filling in those blanks, Schiff complains. But Justice Department special counsel Robert Mueller may be able to find the answers. He can work in confidence. He has a team of professional investigators and prosecutors. He has subpoena power. He has access to the eye-watering electronic surveillance resources of the FBI and National Security Agency. And he has the power to arrest and indict. Mueller has demonstrated his willingness and ability to deploy all of these capabilities. The question now is whether his office can bridge the gaps in the Democrats' account — or whether anything substantiates the missing pieces of their theory. Let's look at two quick examples. Item: Donald Trump Jr. met with a Russian government official, Alexander Torshin, at the National Rifle Association's annual meeting in Louisville, Ky., in May 2016. Trump campaign workers, including then-Sen. Jeff Sessions, already had discussed the Russian government's desire to use the NRA as a back channel to talk with the Trump campaign, as Schiff and Democrats write in their rebuttal released Friday. Moscow wanted an administration with which it could have improved relations after President Barack Obama. Republicans say Trump Jr. and Torshin did not talk about the election, citing Trump Jr.'s denial that they did. Democrats complain the committee took his word and didn't interview anyone else involved. Meaning what? If Mueller's team has foreign intelligence intercepts or other evidence that substantiates the Russian desire to use the NRA and specifically the importance of this contact in Louisville, that would be significant. Not only would that tie Trump Jr. to this Russian "back channel," but it would also substantiate the "infiltration" storyline involving the NRA. Torshin, incidentally, was among the powerful Russians placed under sanction by the Trump administration this month. Item: In June 2016, Trump Jr. received emails describing an offer of help for the campaign via a series of intermediaries from the Russian government. "If it's what you say, I love it," he responded — and got to work arranging to host the delegation who he anticipated would deliver "dirt" on Hillary Clinton. President Trump has denied knowing about this meeting at the time it took place. But former White House chief strategist Steve Bannon has said there was "zero" chance Trump Jr. had not introduced Trump to his guests. And the Democrats' new report says Trump Jr. received a call from a blocked number in between his other phone calls to arrange the session. Trump had a blocked number. Trump Jr. told the House committee he didn't remember who phoned him then. Meaning what? Vol. 1: If Mueller can establish with his subpoena of the Trump Organization or by using other means that Trump senior spoke with Trump Jr. about the Russian visit to Trump Tower as it was being organized, that would implode Trump's denials. And it might add to the understanding about why Trump, Trump Jr. and White House aides later worked together to try to emphasize that the Trump Tower meeting was about "adoptions," as opposed to the Russian government's offer of help for Trump's campaign. Meaning what? Vol. 2: One question no one has yet answered is about the through line of awareness in the Trump campaign about Russia's support. Outreach began as early as the spring of 2016. Human agents began making contact with Trump aides to offer them "dirt" on Clinton and "off-the-record" meetings. The aides reported these offers to their bosses, who in some cases, encouraged them to reciprocate, according to court documents. Were the Russians drilling separate exploratory wells, unsure which one might strike oil? Or did the junior aides who got the initial outreach tell their bosses, who told their bosses, prompting everyone to respond in a unified way? And did the expectations at the leadership level include awareness about Russian mischief before the fact — or promises to reward help with favorable policies post-inauguration? In some cases, there may never be a trustworthy account. Earlier on, Trump Jr. denied there was a quid pro quo in the Trump Tower meeting. But Russian attorney Natalia Veselnitskaya has said there was. Could Mueller ever establish definitively what took place? Trump repeated on Friday that there is nothing to any of this. He told reporters in the Oval Office that he welcomed the House intelligence committee's report. The finding of no wrongdoing proves that all the investigations that continue in the Senate and the Justice Department are just a "witch hunt," he said. "No collusion, no coordination, no nothing," the president said. "It's a witch hunt. That's all it is. There was no collusion with Russia." "The report was very powerful, very strong," Trump said. Are all the facts in this case all the facts there ever will be? The Russia Investigations: What Does Devin Nunes Know? Because for all the contacts that Democrats deem "collusion" and Republicans call merely "ill-advised," nothing has emerged that everyone can agree is a smoking gun. And it's possible that barring a major bombshell, no such new evidence ever could bring both sides to that consensus given how deeply partisan the Russia saga has become. That would be good news for Trump. The other good news for him this week was that his allies will continue to pursue what it calls the "biased" Justice Department and FBI. Lawmakers received another batch of text messages exchanged between two FBI officials who've embarrassed the bureau with their criticisms of Trump and their connections to former Director James Comey, who was fired by Trump, and former Deputy Director Andrew McCabe, who was fired by Attorney General Jeff Sessions. This has proven a fertile line of advance for the president's allies, and lately, it has yielded bigger news than anything in the "collusion" line. The Justice Department's inspector general excoriated McCabe, prompting Sessions to fire him. The full IG report, when it appears, could cause problems for Comey, too. So between Friday's House intelligence committee findings, the continued scourging of the Justice Department and the prospect of more ammunition from a new IG report, the political pendulum on Russia is swinging in a way that helps Republicans — unless Mueller's office fills in the blanks in the Democrats' Mad Libs.